Preparing a batch of I2C Multiplexers « Adafruit Industries – Makers, hackers, artists, designers and engineers! 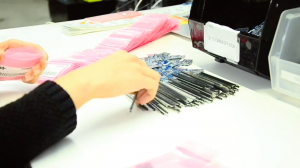 This time-lapse video shows Jackie prepping a batch of I2C Multiplexers. Got a project where you’d like to use multiple I2C sensors? Typically, you are limited to using one I2C (pronounced “i-squared-C”) address per Arduino, but this inexpensive little breakout board expands your I2C capacity from one address up to 8! Lovingly manufactured, tested and prepped all in one place. Learn more about how to use this handy breakout on the Adafruit Learn System.